Mach1 Motorsport started at the German Kart Championship in Ampfing with a large number of drivers last weekend. 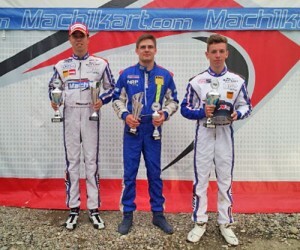 Martin Hetschel’s team braved the partly very difficult weather conditions and placed themselves on the front ranks of Germany’s highest kart racing series in spite of a lot of bad luck. Last weekend, the Schweppermannring in Ampfing (Upper Bavaria) hosted the second event of the German Kart Championship. Heavy rain caused strongly altering track conditions on the 1.063m long track and made the international meeting a challenging undertaking for drivers and teams. Nonetheless, 141 drivers from different nations faced the challenges on and off the track and provided thrilling kart racing on the highest level. The Mach1 Motorsport Team was there as well and started with their drivers at the DJKM, DSKM and the new DMSB Shifterkart Cup. 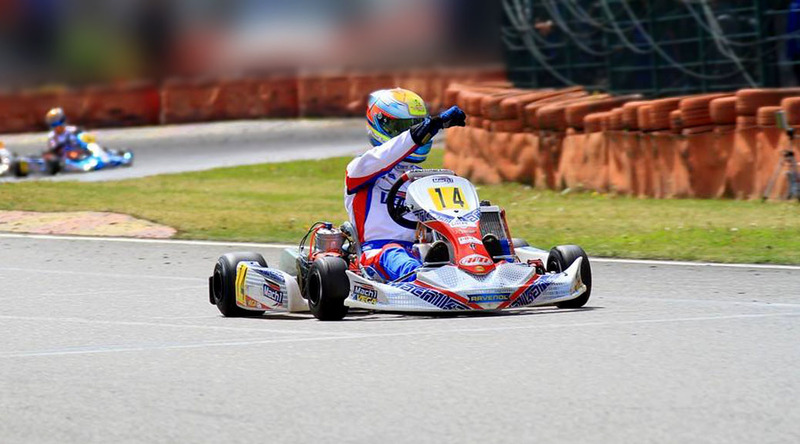 Cameron Boedler started at the German Junior Kart Championship as a soloist and caused a sensation at the beginning of the weekend. As the fastest driver of his group, he was on second position at qualifying and looked forward to the heats with high motivation. “Despite the difficult conditions on the track I got along really well – the kart is doing exactly what I want it to”, explained the German-Brazilian. After technical difficulties during the heats Cameron qualified for the final races via the repechage. But luck wasn’t on his side there either – the Mach1-factory driver had to end the race prematurely. Nonetheless, the youngster gave it his all again after that and managed to drive from the back of the field to 16th position. Three drivers started for Mach1 Motorsport at the hard-fought German Shifterkart Championship. Pawel Myskier showed a good performance. The Pole qualified as 18th driver and was on the pleasing 11th place after the heats, despite a time-penalty in one heat. Among the incredibly homogenous field of the DSKM, Pawel crossed the finish line of both final races on 12th place and even drove the fastest lap during the first race. Experienced driver Douglas Lundberg already gave a lot of power with fifth place at qualifying among 46 drivers. He finished the following heats on the good second place and an eleventh place after a racing accident, which made him fall back to eighth place on the interim standings. After positions 11 and 13 at the races, the Swede is now still on sixth place on the overall list of rankings and still has all chances of racing forward to the cup ranks during the further course of the season. Jordi van Moorsel unfortunately had to deal with more bad luck. After the heats, he had to give it his all at the repechage to get one of the last tickets for the final races. Jordi did this very successfully by achieving second place and then went into the first final race from 30th place. With great overtaking maneuvers, he fought his way forward to 18th place. By ending up on the 21st place at the second race, the Mach1 Motorsport-protégé then just barely missed a top 20 result. 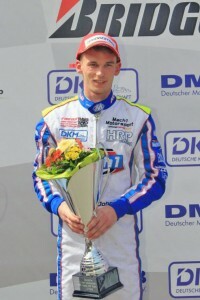 Five drivers drove for the German chassis manufacturer at the DMSB Shifterkart Cup. Toni Greif experienced a perfect weekend. After two great heats, Toni went into the first race from third place and was able to improve his position to second. He then had to deal with a rough setback at the finish line. A construction mistake after the inspection of the engine on Saturday made for an exclusion from the ranking and resulted in a starting position from the back of the field for the second race. There, Toni gave it his all once more and raced forward to 22nd position. Thomas Neumann showed a constant performance. The Bayreuth resident was on the good sixth place after the heats and ended up on eighth and ninth positions at the final races and thereby collected important championship points. Marco Forrer was able to impress as well. A catching-up race from 18th to seventh position during the first race highlighted the efficiency of the Mach1 material. At the second race, Marco had to deal with a time penalty, but was still noted in the result lists on the good twelfth place. Julian Müller started as a guest in the internationally manned DSKC and showed himself in top-form. During the free trainings and warm-up, Julian was always among the top drivers. Qualifying in rain threw him back to 17th place though. At a heat, Julian then had to deal with an exclusion from the ranking due to a misinterpreted gesture of a race director. From 26th place, Julian then drove forward to 13th position during the first final race and thereby proved his skills. During the second race, he then had to park his kart in the off prematurely though. Team mate Tim Schröder experienced a bad weekend. A falling-out during the first race destroyed all hopes for a good result and made the advancement during the second race difficult. The Bad Oldesloe-resident stayed behind his possibilities with 29th place. “The weather really wore us out this weekend. Unfortunately luck wasn’t always on our side during the races. Nonetheless, we were able to prove our competitiveness with the many strong individual results and are looking forward to the next races optimistically. We’re going to keep making an effort to drive among the front of Germany’s highest kart racing series”, summarized team leader Martin Hetschel in the evening. Last weekend, the Mach1 Motorsport team traveled to Bavarian Ampfing for the second event of the ADAC Kart Masters season. The German chassis manufacturer started at the racing event of the second biggest automobile club in the world with three drivers and highlighted their competitiveness. Drivers, spectators and teams experienced a perfect kart racing weekend on the Schweppermannring in Ampfing. Midsummery temperatures and a mostly blue sky warranted thrilling racing action on the 1.063m long track from May 27th – 29th. 176 participants gathered at the track in Upper Bavaria and fought for the next championship points in Germany’s biggest kart racing series. Mach1 Motorsport started in three different categories and were able to prove their potential. Cameron Boedler started with a Mach1 chassis and an engine by German manufacturer Rexon for the first time at the OK juniors. The German-Brazilian quarreled with the difficult track conditions during qualifying on Saturday on 18th place. “Quickly starting rainfall completely altered the conditions – I had to drive on the wet track in Ampfing for the first time and unfortunately wasn’t able to find my rhythm quickly enough”, the youngster explained. With slick tires, Cameron subsequently showed a strong upward trend. After the heats he went into the first race from 14th place and raced forward to 11th place then. During the second race, the young driver even achieved eighth place and thereby collected important championship points. Pawel Myszkier celebrated his debut at the X30 senior category. Usually active at the shifterkarts, last weekend the Pole dared a guest start at the class with gearless IAME-engines and showed a great performance. After qualifying Pawel was on 23rd position in the 32-man field and thereby stayed considerably behind his own expectations. But during the heats the Mach1 factory driver already got along a lot better. Due to eighth and eleventh places he was on eighth position in the interim standings and started into the ranked races from there. During the first race Pawel lost a position due to turbulences but then gave it his all once more and finished his X30 premiere on the impressive fifth place. Julian Müller also started as a soloist at the shifterkarts. After a messed up ADAC Kart Masters kick-off in Hahn (early drop out), things went considerably better for the Cologne resident in Ampfing. On 15th place at qualifying, Julian directly qualified for the final races by being on 10th place after the heats. The Mach1 Motorsport-protégé also finished the first ranked race on this position. During the second race he had to deal with a falling out though and thereby eliminated all hopes for another top ten result. 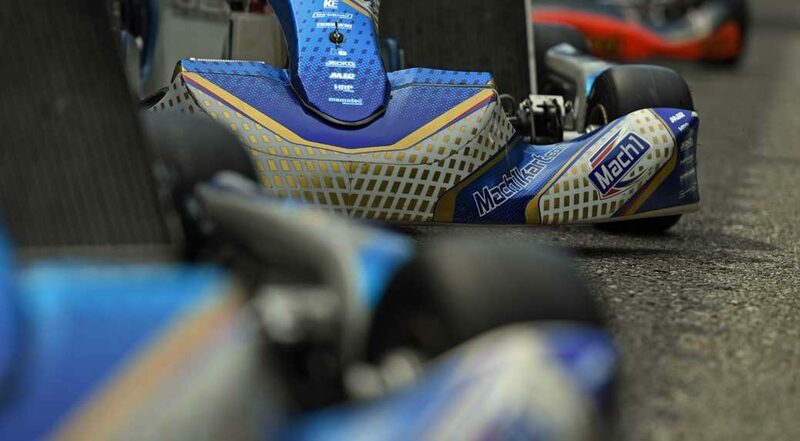 German chassis manufacturer Mach1 Motorsport started at the third event of the German Kart Championship in Ampfing last weekend. The drivers experienced diversified races under changing weather conditions. Unfortunately numerous incidents stopped a successful outcome. Another highlight awaited Mach1 Motorsport before their summer break. The ranked races five and six of the German Shifterkart Championship took place on the Schweppermannring in Ampfing. 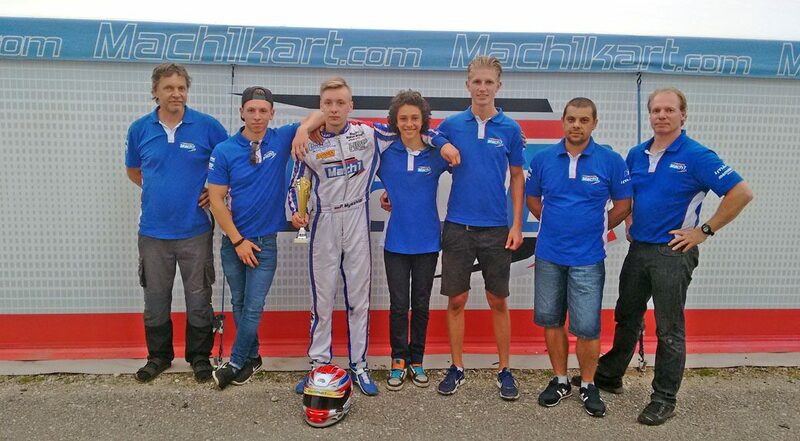 The German kart manufacturer Mach1’s team started with six drivers from four nations. While the sun was shining in huge parts of Germany, the weather in Ampfing was of a mixed nature. On Sunday morning the first final races took place in the rain. During qualifying and the heats on Saturday the 1.060m long track was still dry though. Fastest driver of the team was Irish John Norris, who qualified for the finals by ending up on 15th place. He was then stopped due to a defective clutch during the first race though. From the back of the field he then fought his way forward during the second race and ended up on the good 17th place, which still gained him one championship point. Pole Pawel Myskier celebrated a successful team debut. He achieved a direct ticket to the finals by ending up on 27th place, even though he had to deal with a falling out during one of the heats. On the wet track he then drove as if unleashed during the first race. Coming in 11th he just barely missed placing in the top ten. He was aiming for points during the second race as well but was stopped by an erratic axle in the end. He was able to limit the damages a little by coming in 21st. On the overall list of rankings he climbed from 16th to 13th place after his switch to Mach1 Kart. Kart returnee Thomas Neumann was present in the ranked races as well. He achieved his qualification by coming in third at the repechage but unfortunately had to drop out of the first race prematurely. From the back of the field he drove in the wind shadow of his team mate John Norris during the second race and came in on the good 20th place. The next races are going to take place from September 5th – 6th at the etropolis Motorsport Arena Oschersleben. Before that, Mach1 Kart is also going to start at the ADAC Kart Masters in Kerpen. After the exciting kick-off at the European Kart Championship, Mach1 Motorsport travelled to the second race of the ADAC Kart Masters. In Bavarian Ampfing, the team fought for the victory at the X30 senior class. Unfortunately, everything turned out differently in the end. There was still reason to rejoice, because a Mach1 chassis won at the Bambini class. 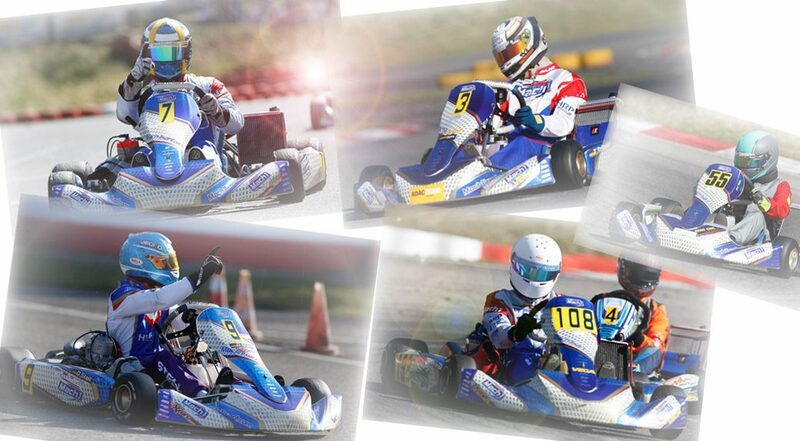 The factory team of the German Mach1 chassis started at the ADAC Kart Masters in Ampfing with four drivers. 199 drivers took part in the five designated classes in great weather. At the X30 senior class, a Mach1 Motorsport driver was able to drive in the forefront. Julian Müller achieved second place at qualifying and also gained a heat victory shortly afterwards. Due to another sixth place, he was on the third overall starting position for the first final race after the heats. Despite his high chances of winning, he was stopped by a defect then. His chain came off and forced the young driver from Cologne to forfeit the race. The disappointment was huge for the team as well as the driver: “Julian is in top condition this weekend and then this happens”, team leader Martin Hetschel said about the events. He then improved his performance during the second race again and fought his way forward from the last starting position to twelfth place. “With his catching up race, Julian proved what kind of performance he would have been capable of”, said Martin Hetschel in the evening. Philipp Heim started at the X30 junior class. He had a good starting position due to his 19th place at qualifying. Unfortunately, things didn’t go so smoothly during the races then. He was only on 29th place after the heats and finished the first final race on this same position. During the second race he had to give up even before the start due to a technical defect during the warm-up lap. 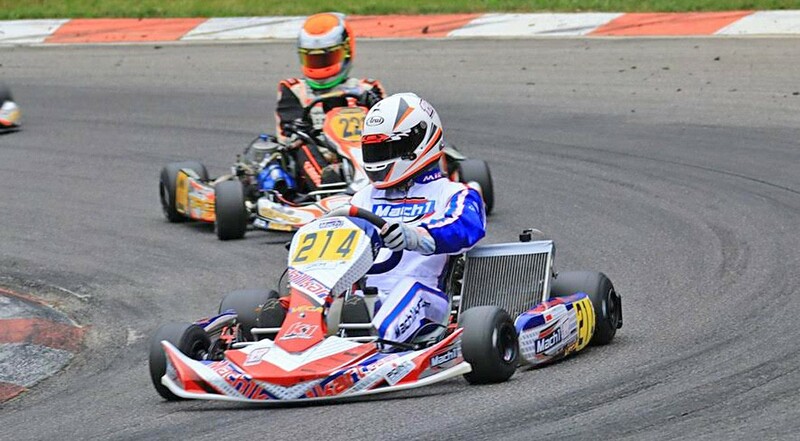 Marco Forrer missed entering the final races at the shifterkart class KZ2. The field was fully manned counting 50 drivers and Marco was able to impress due to fast lap times. Unfortunately, a collision during the second heat cost him qualifying for the finals. “Both of them have shown really good performances within their possibilities. Unfortunately Marco just barely missed entering the finals. His lap times were very competitive and without the collision he definitely would have entered the finals”, Martin Hetschel praised his drivers. DS Kartsport provided a success for a Mach1 chassis. Miroslaw Kravchenko won at the Bambini class. “We congratulate the team on their success. 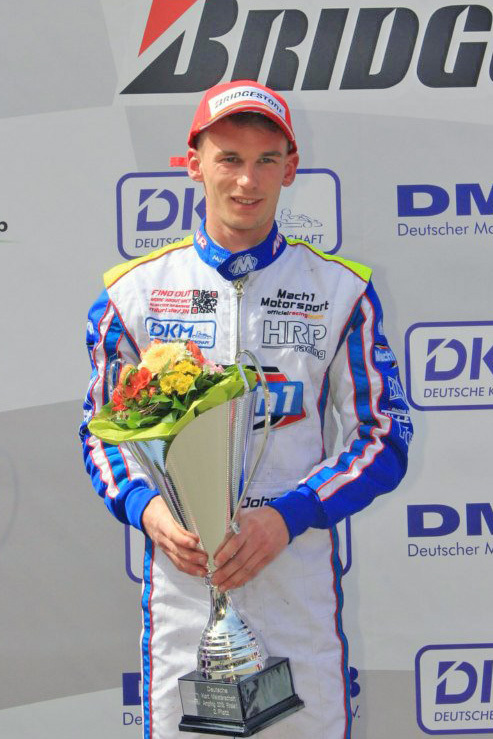 This is the first victory of a Bambini chassis at the ADAC Kart Masters”, Hetschel rejoiced. The team will continue their travels in only four days time. The second event of the German Kart Championship is going to take place in Wackersdorf. 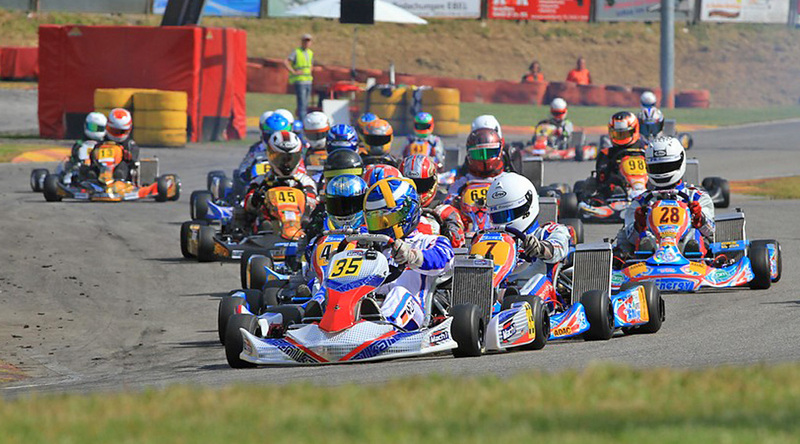 Just a few weeks prior to the European Shifterkart Championship, filled up fields are expected. It could have been a very successful DKM kick-off for Mach1 Motorsport. In Bavarian Ampfing, the drivers belonged to the best and Manuel Valier secured a victory during the first DKM-race. Unfortunately the final races turned into a disaster then. 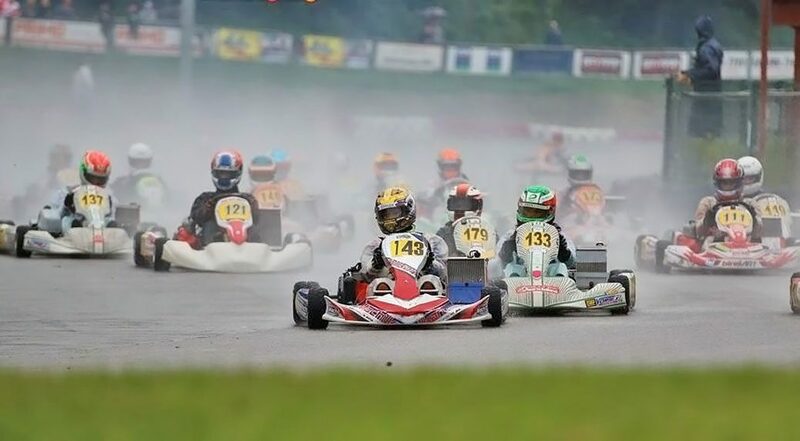 136 drivers from more than 20 nations had travelled to the first event of the German Kart Championship on the 1.060m long Schweppermannring in Ampfing. Four drivers came from the German chassis manufacturer’s team Mach1 Motorsport. Manuel Valier, Julian Müller and British Harrison Newey competed at the DKM. The mood was still a little cautious after qualifying. The duel within the team was won by Valier who came in 11th. The Munich resident then considerably increased his performance during the heats. Coming in eighth and fifth, he was able to improve his performance on the wet track to the overall fourth position and was unstoppable during the first race. He fought his way past his strong opponents during a fierce starting phase and secured the kick-off victory. “Wow, Manuel’s race was incredible”, rejoiced team leader Martin Hetschel. Everything looked like it was going to be repeated during the second race. Valier had a considerable advance up to two laps before the end of the race. But then everything came to a sudden end – Manuel lost his left back wheel and had to forfeit the race. “Nobody deserves something like this. The nuts just loosened. We’re now going to have to identify the problem. A double victory at the beginning of the season would have just been too good to be true”, said Martin Hetschel in the evening. The team is going to start at the next race in two weeks. The ADAC Kart Masters kick-off is going to take place on the Hunsrückring/Hahn. 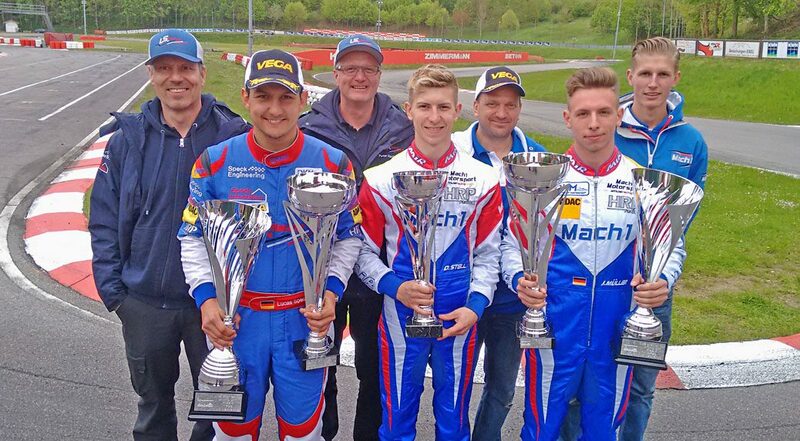 The Mach1 Motorsport team travelled to Bavarian Ampfing for the half time race of the ADAC Kart Masters. Ranked races five and six took place on the 1.063m long track and Mach1 was once again able to impress with their drivers. The team consolidated its’ double lead at the X30 seniors. Alexander Heil and Julian Müller set the pace in the strongly manned X30 senior class once again. The successful duo could be found in the top five of qualifying and the Heats. In summation of the qualification races, Heil came in on the great second place. Müller almost gained pole position. But despite winning one Heat, he lost important places during the second run due to a 10-seconds-penalty and only came in on 8th starting position. The racing weekend went less well for team mates Jan Jesse, Tim Linden, Sebastian Schwendt and Baldur Bahn. The quartet wasn’t able to free themselves from midfield and had to travel home with poor point-yields in the end. In the meantime, Manuel Valier was able to gain some ground. The race was practically a home match for the Munich resident and he proved it on the track. While he had a bit of bad luck during the Heats on Saturday, he gave it his all during the finals on Sunday. Manuel fought his way forward to 3rd place and was able to defend this position during both races. Due to this result, he gained important Championship points and still has chances of placing in the top three on the overall list of rankings. Unlucky fellow of the weekend was Philipp Heim. The junior was on a promising position after qualifying, but an accident during the first Heat forced him to quit the race prematurely. After a medical checkup, the doctors quickly gave the all-clear though. Starting at the finals on Sunday still wasn’t possible for him though. “Philipp still had to take medicine and therefore didn’t get clearance. I wish him a quick recovery and am looking forward to seeing him in a kart again very soon”, Martin Hetschel sent best wishes to his protégé on Sunday evening. “Despite the accident, we can still draw a positive conclusion. We did very well in all of the classes and had several chances of winning races. In the X30 senior class, the Mach1-market share is more than 14%, making us the strongest force in this hard-fought class”, said Hetschel. The next highlight awaits the team in a couple of days already. In Belgian Genk, the Chassis manufacturer will start at the final of the CIK-FIA KZ2 European Kart Championship with John Norris. After gaining the vice Championship title last year, the German chassis manufacturer Mach1 Kart wants to reach for the crown this year. The kickoff in Ampfing already went very successfully and the team is currently on second place on the overall list of rankings. Young Norwegian Nicolai Hagenaes managed to continue his positive trend of the past weeks. During his first race on the challenging 1.063m track, he became faster and faster and started into the first final on Sunday from 21st place. He gained a couple of positions during the starting phase already and established himself in the chasing field. At the finish line, Nicolai came in on the great twelfth place. He managed to gain one more place during the second race, which enabled him to collect his first Championship points. “Nicolai keeps improving himself. He learns quickly and is very good at adjusting to new requirements. By achieving 11th and 12th place he has exceeded my expectations,” Hetschel praised his youngster. Next weekend the team will already be travelling to their next race. The kickoff of the ADAC Kart Masters will take place on the Hunsrückring/Hahn and Mach1 Motorsport will be there with more than ten drivers. At the same time, John Norris and Nicolai Hagenaes will start at the second ranked race of the WSK Euro Series in Sarno.